The sun was also very sub-normally active in February. 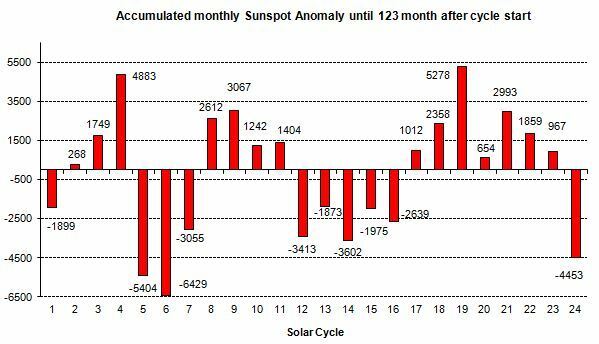 Although we are in the middle of the minimum, the sunspot number of 0.8 for the 123rd month into the cycle is very low. On 26 days of the month no spots were visible, only on 2 days was there a little, symmetrically distributed over both solar hemispheres.The only exciting question currently: When will the minimum be finished and will solar cycle 25 begin? Although 6 spots of the new cycle were already visible in February with a significantly higher resolution, estimates are difficult.March again was dominated by some spots of the “old” SC24. The rule: “weaker cycles often last longer than stronger cycles” could hold. The monthly resolved spot activity of the Sun over the solar cycle (SC) 24 at the beginning of December 2008 (red) compared to a mean cycle, calculated from the arithmetic mean of all previously systematically observed cycles 1-23 (blue) and the not dissimilar cycle 5 at the beginning of May 1798. The strength of the sunspot activity of each cycle in comparison. The numbers in the diagram are obtained by adding up the monthly deviations between the observed values and the mean value (blue in Fig.1) up to the current 123rd cycle month. This document . . .
. . . provides background reading. History. Photos. Charts. Page 20 has a prediction from a year ago. Long term this planet’s climate and weather trends tend to follow the sun-spot numbers, that much is obvious. However sun-spot numbers appear to be an indirect indication of what the consequential impacts will be on this planet. What we do know is that any significant solar variation (such as this ongoing solar minimum) will have impacts on this planet, and those impacts will very probably be a reduction of global temperature over an extended period of time. 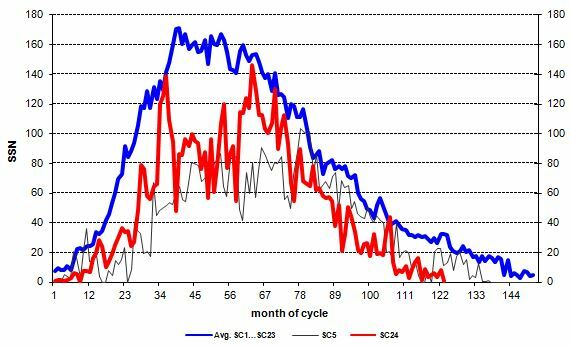 IMO, this solar cycle 24 has more similarities with solar cycle 12 than SC5. It is interesting to compare Cycle 12 (December 1878 to March 1890) with Cycle 24 as it shows a lot of the same general characteristics of Cycle 24, similar rises and falls and double hump profile over a similar timescale. If SC24 follows the SC12 pattern, then it might be that Cycle 24 doesn’t end until sometime in 2020 or later. Gavin’s weather videos at https://youtu.be/yLNVDc-Seq8 (starting at about 10:30 minutes) explains quite well why solar cycles 12 & 24 are so similar. 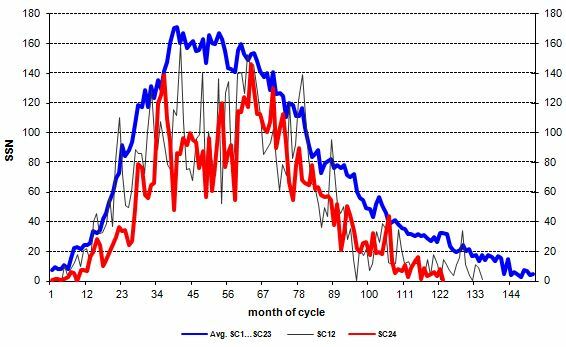 Hopefully the following solar cycles of SC24’s are not like SC13, 14, 15, and SC16 that follow SC12 (SC12-SC16, approximately 1880-1930), when global temperature was at least 1°C below current global temperature. voila, this is the Fig.1 with SC12 for comparison. I would disagree that SC12 is more similiar to SC24 than SC5. It started much faster and it was much more active over the whole cycle. In sum it produced a more than 1000 higher SSN. However, the early cycles before SC14 ( before 1900) are of course more uncertain than the following. SC5 is slightly lower than SC24, SC12 is slightly higher. SC5 has no double hump feature SC12 like SC24 has. As you say SC12 started faster while I see SC5 started slower than SC24. Overall I still think SC12 is the better match, certainly so for the decline to minimum. Either way SC5 or SC12 it looks like we’re in for a chilly time, like an extended 1960-1970s, or worse, like a Dalton minimum — who knows, place your bets. It takes a pretty good period before the temperatures are effected. This March is on track to be above average temp globally. Third highest for the US. But if this period of low solar activity does turn out to be extended and the AMO does go into negative territory as it looks like it’s going to, then look out! We’re headed back to the 70s when they were harping about a coming ice age.